« The Creative Minds Behind: Visible Straps. Bean Too Hot! Bayou City Art Festival. We think it’s been (bean in our case) way too hot. So we brewed up an idea to float in Houston’s City Hall Reflection Pond this October. You may recall in August we talked about the invitation to submit ideas to the Art colony Association. 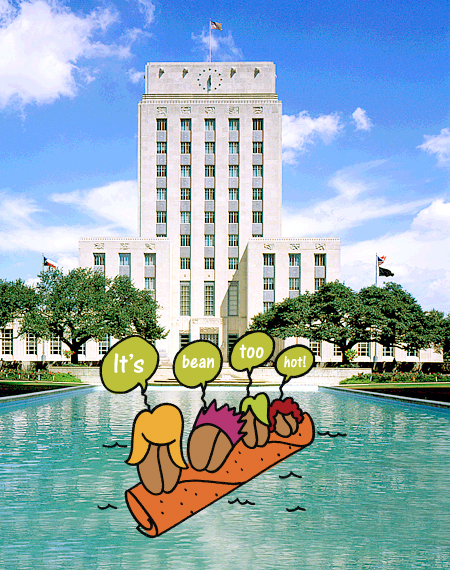 The bean team floated this idea below. Hot or cool – the Bayou City Art Festival Downtown takes place on October 10-11, 2009. This entry was posted on September 18, 2009 at 4:27 pm and is filed under Art Shows, Events. You can follow any responses to this entry through the RSS 2.0 feed. You can leave a response, or trackback from your own site. I love it! It’s timely, appropriate, and in good taste! It’s HOT! Best bean post I have seen yet, community, products, process, results! You’ve got to put up signage: Geniuses at work here! Think it is great, as all you do. I just LOVE this site!!!! Will they let you use canvas? Jim – Yes, I believe canvas could work. All materials must be waterproof and non-biodegradable. We want to keep the pool cool.